Over the years, gospel music has received all kinds of accolades and lip service from critics and musicians attesting to its profound influence on American popular music. Rock and roll began in the church after all. But unless you grew up around or in a church and absorbed all the Bible verses, preacher chants and sermons and, of course, the music, you have to really dig to start uncovering the music itself. Precious little has been reissued and made accessible to a wider audience. But things are beginning to change. The last ten years has seen an increasing appearance of gospel reissues and the vast, previously uncollected vinyl corpus has finally drawn the attention of the influential soul and funk collectors. The lost are coming to the Lord. At the same time, misleading overly romantic stories and myths too often mar accounts of American popular music: Jimi Hendrix injected LSD into his eyeball; Robert Johnson sold his soul to the devil in order to gain his musical skills; and Hank Williams was always drunk. Here we have the Saturday night blues vs. the Sunday morning gospel cliché to overcome. One can’t play the blues and the gospel the story goes. Leo “Bud” Welch lays all this nonsense as low as the shrubs and trees he cut for over 30 years with his chainsaw. With his guitar sounding like a well-oiled Husqvarna, Welch uses the weapon that has killed many a lie, myth and story: the truth. I don’t know what you came to do but I came to praise his name; I came to sing my song. It seems incredible that Leo Welch has until now remained unknown to the wider musical world. 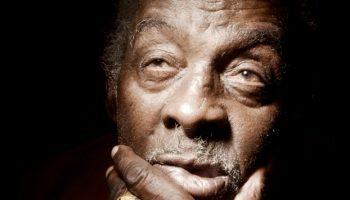 Born in 1932 in Sabougla, Mississippi Welch has lived his entire life in the area. Raised with four brothers and seven sisters, Welch’s musical ability was first noticed by his family when he and his cousin Alandus Welch. took to an older cousin’s guitar quicker than the owner R. C. Welch. Soon, Leo andR.C were picking out tunes heard on the radio and playing them for family and friends. Welch also picked up the harmonica and fiddle along the way. As the years passed Welch continued to entertain at picnics and parties in the area usually accompanied by his friend Otis McCain and often joined by first cousin R. C. Welch. Their repertoire consisted of many of the blues and radio standards and favorites of the day. On several occasions, Welch came to the attention of professional musicians, but planned auditions or jam sessions never worked out. When the Mondays rolled around, Welch was back at work, logging with his chainsaw or working on a local farm. Still, Welch played on, absorbing songs and listening to anything on the radio. Gospel music was a particular favorite and Welch learned the gospel repertoire at church and by listening to gospel groups like the Fairfield Four on Nashville’s clear channel WLAC. Even the name of Welch’s then current group, Leo Welch and the Rising Souls, suggests a belief in spiritual redemption anticipating the direction Welch would take. One possible reason Welch flew under the radar for so long was his move into the church around 1975. The vast network of churches in Mississippi and the South offered consistent, safe venues to perform. Welch’s brand of blues was becoming old fashioned and gigs were harder to come by. The churches offered a place where a musician like Leo Welch could still play his style, just slightly modified for the gospel. To this day these music programs and services often pass unnoticed to even lifetime residents in the local communities. Outside music enthusiasts who have obsessively canvased places like Mississippi over the last 75 years have largely overlooked the churches in their ceaseless attempts to discover a juke joint out of time. It wouldn’t be that far from overstatement to say that any single county in Mississippi probably has more churches than the all-time sum total of juke houses. But Welch never let the blues go. He has never seen any reason to: “I believe in the Lord, but the blues speaks to life, too. Blues has a feeling just like gospel; they just don’t have a book (a Bible).” Welch continues to sing with two local gospel groups in the Bruce, Mississippi area, The Spiritualaires of Bruce, Mississippi and Leo Welch and the Sabougla Voices. You can also catch Leo hosting The Black Gospel Express TV show every 1st and 5th Sunday on WO7BN-TV in Bruce. Lately, there seems to be a tolerant and accepting Samaritan like empathy appearing among former church goers and the like outside of the physical churches themselves. Preacher’s kids and individual exiles from Baptist and Pentecostal churches who still quietly respect and follow the teachings of Jesus but suffocated under the dogmas of the physical churches have quietly set up shop in the cultural nooks and crannies of America. Some of these very same exiles have come together to make this record with Brother Leo Welch. And make no mistake; this is a gospel record. So don’t go looking over your shoulder when you are listening to these songs. Come on into this church. There won’t be any old church ladies staring you down from the self-righteous section of the pews. It’s all right. Despite what some folk might insist, church isn’t always under the steepled roof. Where ever you are, have a sip, tap your foot, stomp it even fellowship with your friends and rejoice with the Lord and Leo “Bud” Welch. Crank it.